We are delighted to announce that we are open for business in our new premises at 3 Bury Street, St James's. We look forward to welcoming you to our new space! Priestley & Ferraro specialises in early Chinese art, with a particular focus on the ceramics of the Song dynasty. The Song dynasty and the dynasties immediately preceding and succeeding it were in ceramics terms the most exciting and innovative in Chinese history, with kilns all over China making beautiful and characteristic wares. In this rich and rewarding field we aim to find for the collector the finest and most interesting pieces. Apart from ceramics, we also buy and sell many types of works of art, again with an early focus. This includes Song dynasty silver and plain lacquer, Yuan and Ming dynasty carved lacquers, and Ming dynasty jades and cloisonné enamels. We also deal in sculpture, including Han dynasty and Tang dynasty pottery animals and figures and Buddhist stone carving, as well as some paintings on silk. The business was established in 1994 by David Priestley and Benedicta Ferraro. David studied Song dynasty ceramics under Mary Tregear at Oxford, before joining Sotheby's in London where he worked as an expert in the Chinese Department. 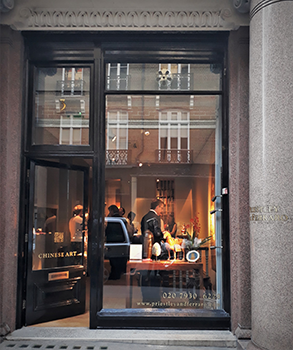 The gallery is located in St James's, south of Piccadilly, an area rich in dealers and famous for being the home of Christie's, the auctioneers, who hold regular sales of Chinese art. Priestley & Ferraro is a regular participant in Asian Art in London and Asia Week New York. Priestley & Ferraro is a member of the British Antique Dealers Association (BADA).